Located at the heart of the German city of Bielefeld, the client service centre is found, which has offered a multitude of varied and essential functions since 1929, such as energy information and contracting, drinking water, telecommunications, energy recovery from waste, free time, event tickets, and tickets for swimming pools and saunas, etc. Its main function has been the sale of tram, metro and bus tickets, and it is a busy space which since 2017 has had a new image thanks to the design by InnenArchitektur & Design Sebastian Büscher, in which we can find KRION as one of the materials selected for the project. 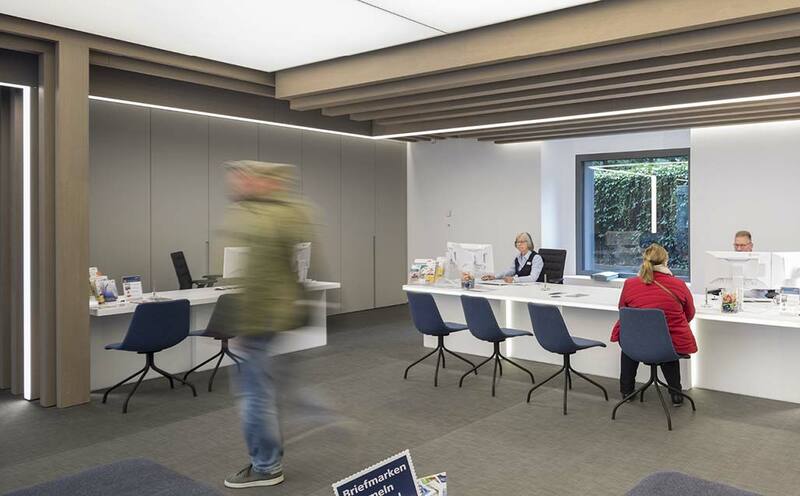 The new Haus der Technik space in Stadtwerke Bielefeld is divided into two atmospheres: the area for presentation of new projects, and the consultation area in which the Solid Surface from PORCELANOSA Group, KRION, is best represented. Both Sebastian Büscher, as the KRION transformation company, and Möbelwerkstaff Richard Mangel have been able, with the colours 1100 Snow White and backlightable 4102 Extreme Light, to create an elegant, functional and high quality workspace where the day to day work of employees and all those who require their services has been made pleasant. The combination of the pure white colour of KRION, the backlightable lines and lit low relief as a sign are perfectly combined with the natural wood with which they share the space, with KRION transformed into a 5 metre counter, a conference table and seven desks.